I had made a Mardi Gras dinner last week at Sean’s request so I tried to find some recipes for some good side dishes that fit the theme we were going for and were going to be easy to make. Since I was making gumbo as the main part of the meal, I wanted to have some bread to go with it and what would be better than some corn bread? Well I found this recipe on Epicurious for a sweet potato corn bread that sounded really tasty and very easy to make, so I thought I would give it a shot. Preheat the oven to 375 degrees. Butter a 9 inch by 9 inch baking pan. Pierce the sweet potatoes in several places with a fork. Microwave the sweet potatoes on high until they are tender to the touch, turning once, about 12 minutes. Cut open the potatoes and allow the flesh to cool. Mash enough of the potatoes to yield 1 cup packed. Reserve the extra mashed sweet potatoes for another use. Place the 1 cup of mashed sweet potatoes in a large bowl. Whisk in the eggs and the buttermilk. Blend the cornmeal, flour, granulated sugar, baking powder, salt, baking soda and ground ginger in the food processor. Add the pieces of chilled butter and blend in the food processor until the mixture resembles a coarse meal. Add the cornmeal mixture to the egg mixture and stir until they are just blended. Transfer the mixture to the prepared baking pan. Bake the corn bread until it is a deep golden color on top and a toothpick or tester inserted into the center of the corn bread comes out clean, about 45 minutes. Cool the corn bread in the pan on a baking rack. Serve or let stand at room temperature and serve when you are ready. Cooking the sweet potatoes in the microwave saves you at least an hour of cooking time in the oven and helps you get the corn bread made a lot faster. I think the bread came out really well. it was not at all dry like some corn bread can be and had a great flavor from the sweet potatoes. If anything, it maybe could even used a bit more sweet potato for extra flavor. This recipe makes a lot of cornbread and says it will serve 10 to 12 people. I actually cut the recipe in half and made a smaller batch for us and we still had plenty to last for the week. 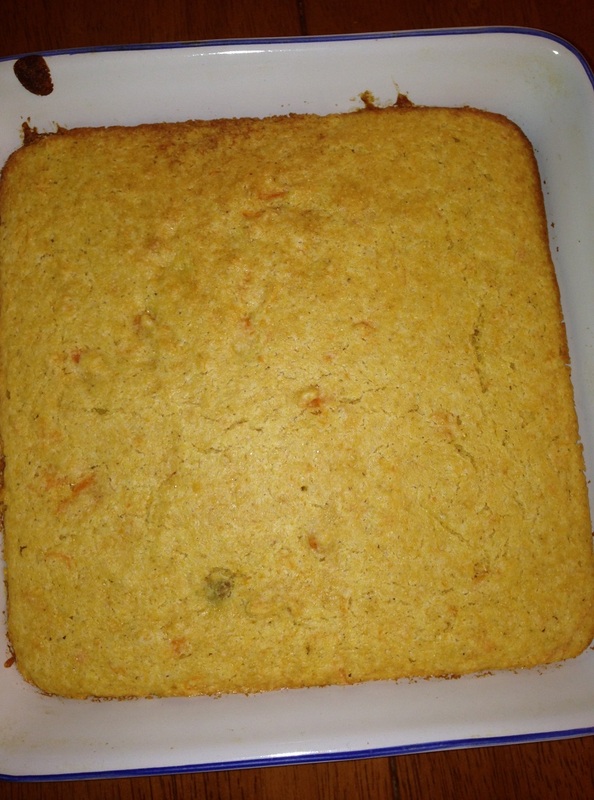 I think I would make this one again as it seemed better than some of the traditional cornbread recipes I have tried. That’s all I have for today. Check back tomorrow for another recipe. I still have a couple of good southern sides to share – a red rice recipe and a baked beans recipe from Jamie Deen, along with the gumbo I made for Mardi Gras, some parfaits, a new pulled pork recipe, beef stroganoff, chicken fingers, 3 pork burgers and a whole lot more. Until next time, enjoy the rest of your day and enjoy your meal!